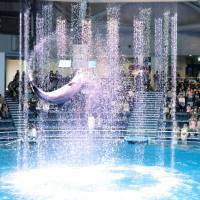 Enoshima Aquarium in Fujisawa, Kanagawa Prefecture, extended its hours of operation to 8 p.m. from 5 p.m. to accommodate a show dubbed “Night Wonder Aquarium 2016” for a limited period from mid-July until Dec. 25. During the show, visitors watch projection-mapping that includes a moonlit shimmering sea in a large high-ceilinged tank while listening to music and other sounds. “I visited an aquarium as a child, but it was the first time for me since then. The video images were beautiful,” said a university student from the city of Hadano, also in Kanagawa Prefecture. The aquarium used to attract around 1.3 million visitors per year before 2014, when it kicked off the night event to commemorate its 10th anniversary. The number jumped to a record 1.84 million in fiscal 2015. Aqua Park Shinagawa in Tokyo’s Shinagawa Ward, which reopened in July last year after a full renovation, is also seeing more visitors. 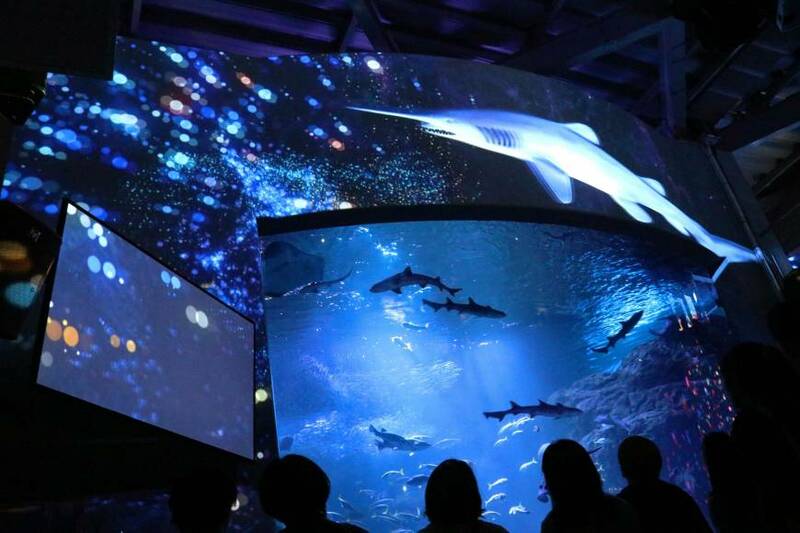 “We not only exhibit aquatic animals but also have blended sound and light to create entertainment enjoyable for adults,” said Naoto Takahashi, head of the aquarium. Young couples and office workers comprise the overwhelming majority of visitors to the aquarium in the evening, as it stays open until 10 p.m. The venue also has a bar serving alcoholic beverages. 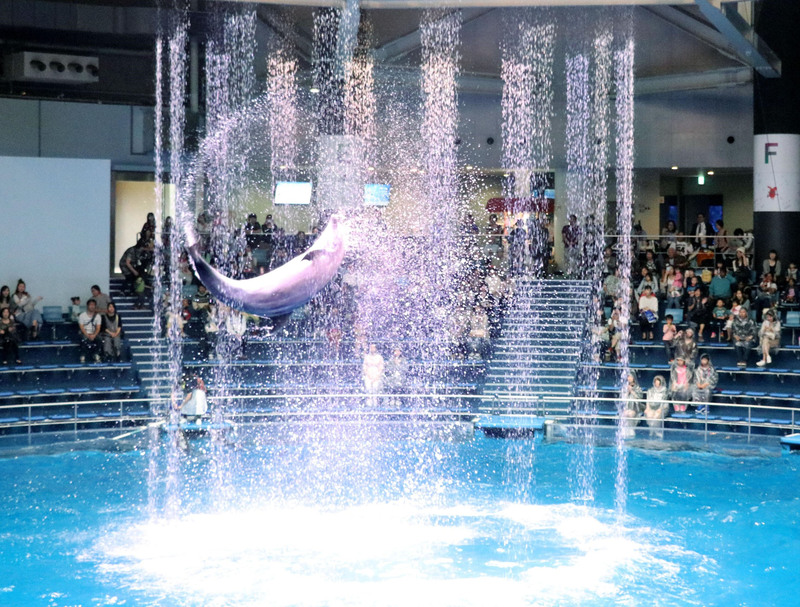 The biggest attraction at Aqua Park is performances by dolphins that include a water curtain. The number of visitors to Aqua Park in the first year after its renovation more than doubled from the previous year to 1.82 million. 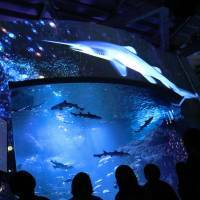 Sunshine Aquarium in the Ikebukuro commercial and entertainment district in Tokyo’s Toshima Ward was re-launched as the Oasis in the Sky in August 2011. Located in the 60-story Sunshine City building, the aquarium shows creatures in crystal-clear water to “comfort fatigued people,” said Katsushi Maruyama, the facility’s director. Its attractions include a doughnut-shaped container enabling visitors to see sea lions directly from below and a tunnel that visitors can walk through while viewing glowing jellyfish.